This function draws a circle shape on the screen - rendered for one frame. This should be used in conjunction with onClientRender in order to be display continuously. An example of how dxDrawCircle function works in practice. posX: An integer representing the absolute X position of the circle center, represented by pixels on the screen. posY: An integer representing the absolute Y position of the circle center, represented by pixels on the screen. 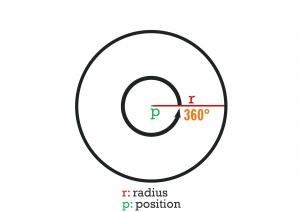 radius: An integer representing the radius scale of the circle that is being drawn. startAngle: An integer representing the angle of the first point of the circle. stopAngle: An integer representing the angle of the last point of the circle. theColor: An integer of the hex color, produced using tocolor or 0xAARRGGBB (AA = alpha, RR = red, GG = green, BB = blue). theCenterColor: An integer of the hex color, produced using tocolor or 0xAARRGGBB (AA = alpha, RR = red, GG = green, BB = blue). segments: An integer ranging from 3-1024 representing how many triangles are used to form the circle, more segments = smoother circle. Note: using lots of segments may cause lag. ratio: Ratio between width and height, e.g: 2 would mean that the width of the circle is 2 times the height. postGUI: A bool representing whether the circle should be drawn on top of or behind any ingame GUI (rendered by CEGUI). Returns true if the creation of the 2D circle was successful, false otherwise. This function draws a rectangle with rounded corners. This page was last modified on 26 March 2019, at 20:32.